Nicola Sharon Mendelsohn, Lady Mendelsohn CBE (née Clyne; born 29 August 1971) is a British advertising executive. Active in the advertising industry since 1992, she was named Vice-President for Europe, the Middle East and Africa for Facebook in June 2013. She is also a non-executive director of Diageo. The Daily Telegraph has called her "the most powerful woman in the British tech industry". Nicola Sharon Clyne was born in Manchester, England. Her mother, Celia Clyne, is a kosher caterer; her father Barry Clyne is Chairman of Celia Clyne Banqueting, and her brother Mark also works in the family business. She was a youth member of the Jewish youth organisation the BBYO (formerly the B'nai B'rith Youth Organization) and attended Manchester High School for Girls from 1982 to 1987. From 1989 to 1992 she attended the University of Leeds, graduating with a bachelor's degree in English and Theatre Studies. In her senior year, she helped raise £20,000 for Jewish causes. Mendelsohn originally planned to attend drama school and become an actress, but on a friend's recommendation decided to explore advertising instead. She was offered a graduate training scheme at Bartle Bogle Hegarty, where she worked from September 1992 to January 2004, advancing to Business Development Director. In April 2004 she became Deputy Chairman of Grey London, serving in that capacity until December 2007. She was also European Business Development Director for the Grey Communications Group from 2004 to 2008. In April 2008 she became partner and executive chairman at Karmarama, a London advertising agency. In 2013 she was hired as Facebook Vice-President for Europe, the Middle East and Africa, ending the company's half-year search to replace outgoing VP Joanna Shields. She brings her extensive advertising and political contacts to the job, which is the company's most senior position outside the US. Mendelsohn is a strong advocate of work–life balance and flextime for women with families. She has worked a four-day week since her first child, born during her tenure at BBH, was one year old. At Facebook, too, she works only from Monday to Thursday. Mendelsohn is co-chair of the Creative Industries Council and director of the Bailey's Prize for Women's Fiction. In April 2011 she became the first female president of the Institute of Practitioners in Advertising, serving a 2-year term. In September 2014 she became a non-executive director of Diageo. Previously, she was a board director for Bartle Bogle Hegarty and the Fragrance Foundation, chairman of the corporate board of Women's Aid, trustee of The White Ribbon Alliance, and president of the Women's Advertising Club of London. In 2015 she was made a Commander of the Order of the British Empire (CBE) for services to the creative industries as part of the 2015 Queen's Birthday Honours. Also in 2015, Computer Weekly ranked Mendelsohn number 34 on its "50 Most Influential Women in UK IT 2015", she was named one of the Most Inspiring Women in European Tech by the Inspiring Fifty organisation, and Debrett's included her on their "People of Influence" in the Debrett's 500 2015. In 2014 she was included on GQ's list of the 100 Most Connected Women in Britain, and ranked number 85 on The Jewish Chronicle's Power 100 list. In 2013 she ranked number 69 on The Guardian's "MediaGuardian 100 2013". In 2011 she was named one of Advertising Age's "Women to Watch". In 2005 Management Today included her on its list of the top 35 women under 35 in the business world. In 2017, she was awarded an honorary Doctorate at the University of Salford. She married Jonathan Mendelsohn, a British lobbyist and Labour political organiser, in 1994. He was created a life peer as Baron Mendelsohn, of Finchley in the London Borough of Barnet in 2013. She and her husband are Jewish and are active in their synagogue and Jewish community. In November 2015 they became the new presidential couple for the Norwood Anglo-Jewish family services charity. They reside in Finchley with their three sons and one daughter. On World Cancer Day (4 February 2018) she made public that she had been diagnosed with follicular lymphoma, an incurable cancer of the blood. Mendelsohn said that she made the announcement to raise awareness about the cancer, describing it as not rare but little-known. "Do what you'd do if you weren't afraid, says Facebook's Nicola Mendelsohn". Marketing. 30 June 2015. "Reflecting on Women's Achievements on International Women's Day". HuffPost. 6 March 2015. Retrieved 22 November 2015. ^ "Birthdays today: Lady Mendelsohn, 43". The Times. 29 August 2014. Retrieved 22 November 2015. ^ Curtis, Sophie (23 March 2015). "Meet the most powerful British woman in the tech industry". The Daily Telegraph. Retrieved 22 November 2015. ^ "Celia Clyne Banqueting Limited". Endole Ltd. 2015. Retrieved 27 November 2015. ^ a b c d e "Nicola Mendelsohn". Debrett's 500 2015. 2015. Archived from the original on 27 July 2015. Retrieved 22 November 2015. ^ a b c d e f g "Nicola Mendelsohn gets top Facebook job – and insists on working a four-day week so she can see her family". Capital Bay News. 8 May 2013. Retrieved 22 November 2015. ^ a b c d e f g "Nicola Mendelsohn". LinkedIn. 2015. Retrieved 22 November 2015. ^ a b c Taub, Rebecca (3 April 2013). "Nicola Mendelsohn – Executive Partner and Chairman of Karmarama and Co-Chair Elect of the Creative Industries Council". You and Us. Retrieved 27 November 2015. ^ a b Stone, Jason (9 May 2013). "Levi's, The Godfather, Boddingtons, Alien: Desert Island Clips with Facebook VP EMEA Nicola Mendelsohn". The Drum. Retrieved 27 November 2015. ^ Lunden, Ingrid (7 May 2013). "Facebook Appoints Ad Vet Nicola Mendelsohn As Its New VP For EMEA". TechCrunch. Retrieved 26 November 2015. ^ a b "69. 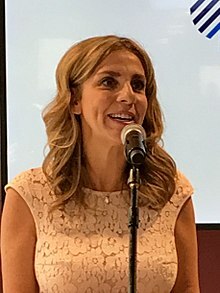 Nicola Mendelsohn". The Guardian. 1 September 2013. Retrieved 27 November 2015. ^ Shead, Sam (25 March 2015). "Baroness Joanna Shields vs Lady Nicola Mendelsohn: The battle for the title of the most powerful female in the UK tech sector". Tech World. Retrieved 27 November 2015. ^ a b Moorhead, Joanna (27 June 2005). "The faces of the future". The Guardian. Retrieved 27 November 2015. ^ a b Gardner, Jasmine (1 July 2014). "Nicola Mendelsohn: the London-based Facebook boss who wants to share her status". London Evening Standard. Retrieved 23 November 2015. ^ a b c Hall, Emma (30 May 2011). "Women to Watch: Nicola Mendelsohn, Institute of Practitioners in Advertising; Karmarama". Advertising Age. Retrieved 23 November 2015. ^ a b "Nicola S Mendelsohn". Diageo. 2015. Retrieved 27 November 2015. ^ Smith, Oliver (15 June 2015). "Tech stars headline Queen's Birthday Honours". The Memo. Retrieved 27 November 2015. ^ "34. Nicola Mendelsohn, Managing director, Facebook Europe". Computer Weekly. 2015. Retrieved 27 November 2015. ^ "Meet the Most Inspiring Women in European Tech". Inspiring Fifty. 2015. Archived from the original on 25 September 2015. Retrieved 27 November 2015. ^ "GQ and Editorial Intelligence's 100 Most Connected Women 2014". GQ Magazine. 2015. Retrieved 23 November 2015. ^ "JC Power 100: Numbers 100 – 51". The Jewish Chronicle. 28 August 2014. Retrieved 23 November 2015. ^ "No. 60621". The London Gazette. 9 September 2013. p. 17761. ^ "No. 60637". The London Gazette. 24 September 2013. p. 18815. ^ Morris, Nigel (1 August 2013). "Doreen Lawrence and Brian Paddick among 30 new peers in House of Lords". The Guardian. Retrieved 27 November 2015. ^ a b "House of Mendelsohn: Jon Joins Lords, Nicola Leads Facebook to Israel". Algemeiner Journal. 17 October 2013. Retrieved 22 November 2015. ^ Jackman, Josh (16 November 2015). "Facebook boss and political insider are Norwood's new presidential couple". The Jewish Chronicle. Retrieved 27 November 2015. ^ Petroff, Alanna (5 February 2018). "Facebook's Top Exec in Europe Has Incurable Cancer". CNN. Retrieved 28 March 2018. ^ "Facebook executive has 'incurable' cancer". BBC News. 5 February 2018. Retrieved 5 February 2018. ^ Dixon, Hayley (4 February 2018). "Facebook Boss Nicola Mendelsohn Reveals She Has Incurable Cancer". The Telegraph. Retrieved 28 March 2018.